Silken firm tofu is the secret ingredient in these vegetarian hors d’oeuvres. Have you ever opened the crisper in your fridge looking for something in particular but finding something unexpected, something you can’t quite make out because it has shriveled to the point of unearthliness? That just happened to us. The unidentified lying object? Zucchini, and a small one at that. We had every good intention of using it—we even discussed how cute it was at the grocery store—but as we unpacked, we unceremoniously relegated it to the nether reaches of the bottom drawer. Forgotten, until now. We’d like to tell you that we transformed this limp courgette into something magical, but alas, we did not. It ended up in the garbage. We haaaate throwing away food. As penance, we decided to buy more of these green, mildly flavored squashes with the sole purpose of creating a cocktail party hors d’oeuvre so good, we would never ever allow another zucchini to transmogrify in the crisper. 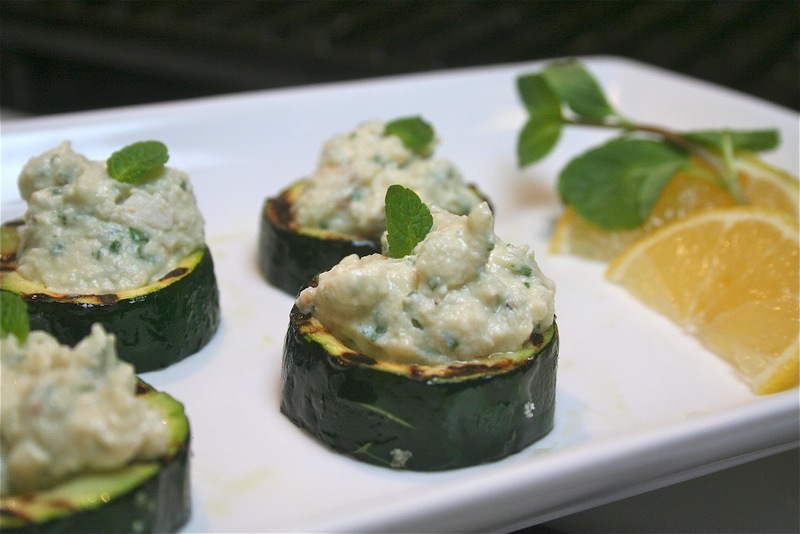 After playing around with the ratios of these items and adding some toasted pine nuts, we decided that these stuffed grilled zucchini bites would be the perfect one-bite party-food accompaniments to a fizzy gin drink. 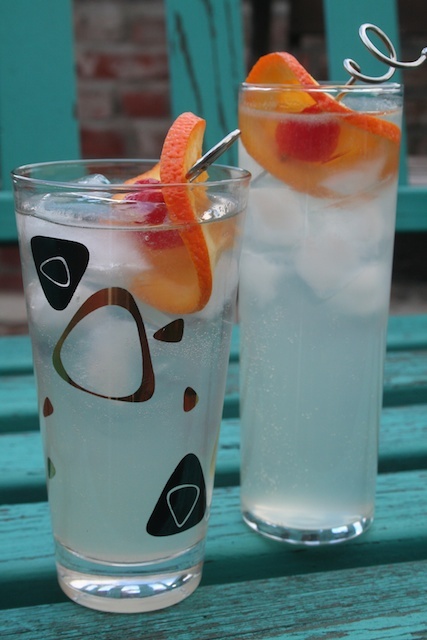 (The herbal, floral flavors in gin pair so well with a variety of spring and summer vegetables.) We had some leftover watermelon–sake ice cubes from the Gin Stevies we made in the fall, so we decided Gin Stevies it would be. And how serendipitous that we had basil and mint leftover too, not only for the stuffed grilled zucchini bites, but for the Gin Stevies as well. The pairing was blissful. Perfect, really. The way the watermelon in the drink intermingled with the Romano and provolone cheeses in the zucchini bites reminded us why we do this. 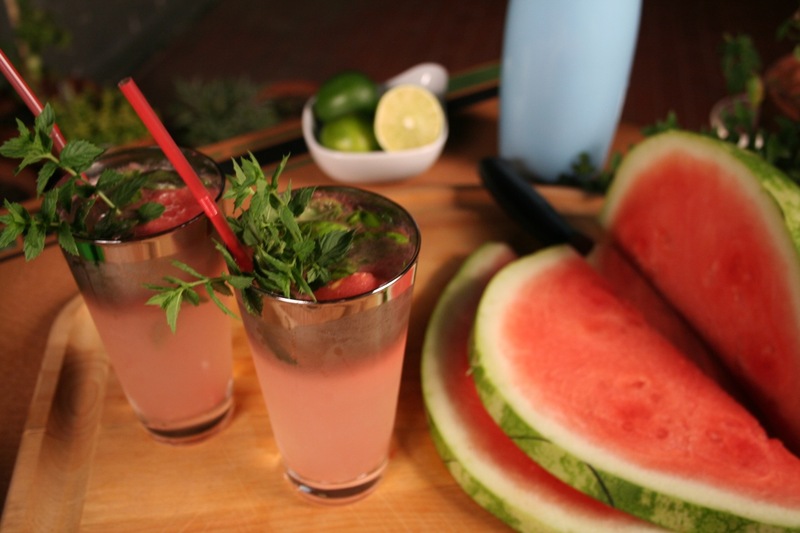 Who can resist a really good cocktail–party food pairing? And as the weather continues to get warmer, you can serve these zucchini bites al fresco, with perhaps a Tom Collins, a French 75, a Brandy Old-Fashioned, or a Langdon’s Folly, made with pomegranate juice, or even a Clear, a vodka–gin combo fizzy drink with elder flower liqueur and subtle hints of ginger and celery. Enjoy zucchini as you’re meant to enjoy it. Grilled, full of flavor, and with a cocktail companion. Heat grill over medium heat. Wash zucchini and set aside. Meanwhile, toast pine nuts on medium-low heat in a saute or fry pan until fragrant and slightly browned. Mix with remainder of ingredients (except sugar and mint leaves, if using) in a food processor until completely incorporated, but not overly smooth. You want to see bits of basil leaf in the stuffing. If you are mixing by hand, make sure to chop the basil leaves and pine nuts into small pieces first. Cut zucchini into 1/3-inch thick pieces. Hollow out center with a tablespoon, leaving flesh on the bottom so the mixture will sit in it without going all the way through. 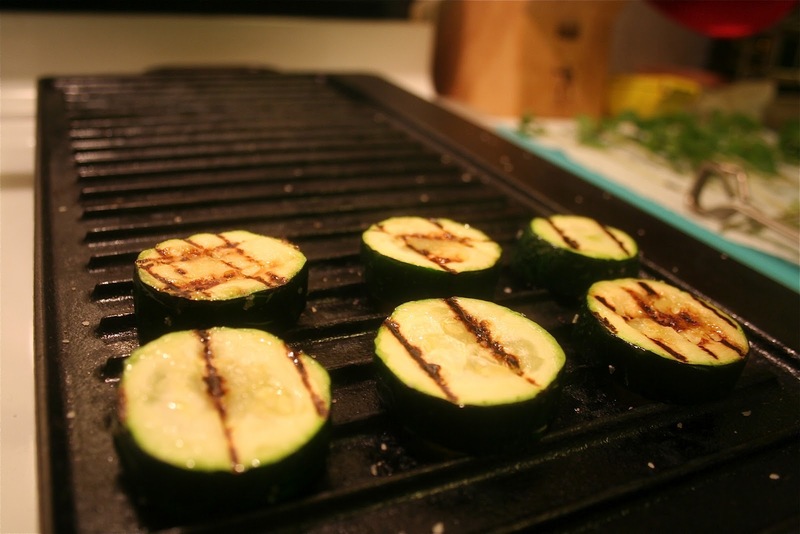 Place pieces on grill, hollowed side down, and grill for 5 to 7 minutes, until grill marks form. Sprinkle bottoms with sugar if you are using (this creates a more blistered look and gives the zucchini a slightly more caramelized flavor and texture). Flip the pieces and grill for another 5 to 7 minutes. Remove from heat when grill marks have formed and the zucchini flesh and the outer green skin has softened. Add dollops of the stuffing to each piece. Top with a squeeze of lemon juice and a tiny mint leaf (if using). The stuffing can also be served with raw zucchini, thinly sliced. Feel free to use yellow zucchini, also known as summer squash. Craving a Tom Collins to accompany your stuffed grilled zucchini bites? The beauty and splendor of a deviled quail egg, topped with caviar. Lean closer to it. You can almost hear it begging for a cocktail accompaniment. Behold the egg. Touch it. Is it cold? Or have you let it sit out on the counter for a spell? Rub your finger along its surface. Smooth and hard. Now crack it open and apply your wizardry. Dexterity is important here. Best to not waste one bit of the precious viscous albumin. Hungry? Why not transform it into an omelet, thin and buttery, filled with your favorite mouthwatering bites. Add some meltable savory cheese to bind the egg to the filling. Or perhaps you are thirsty? Shake an egg up in your cocktail and you’ve made yourself a Flip. Just want the whites? No problem. You’ve just made a Fizz. Take a sip. So silky. Anyway you use it, the egg will add richness and texture to your creation. And speaking of creation . . . . In our last post, we discussed food as symbols, and one we touched on briefly was the egg as a symbol of fertility and springtime renewal, although we eat them year-round, thanks to the modern market. When we visit the grocery store, we see these eggs huddled in their cartons, with labels touting that their parents were “organically fed,” “without hormones,” and “cage free,” but if you stop to think about these little eggs as you’re checking them for nicks and cracks, you realize that they are a super-important part of our diet. For Paul, they just may well be his desert-island protein; for Steve, well, Steve came to them a little later in life, won over by Paul’s love and admiration for them. Sure, he crafted elaborately decadent cakes and confections with these elliptically shaped beauties, but they never were the center of attention. Until now. One egg dish we can agree on is a platter of deviled eggs. How charmingly common, yet deviled eggs are now on the menus of fancy restaurants around the country. This simple preparation has become unmistakably retro chic. Especially accompanied by a cocktail. Why not Champagne? Champagne and eggs make a great team. 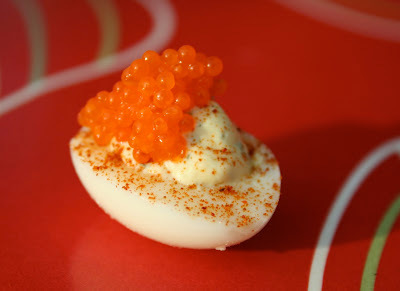 But since we like to make food for cocktail parties, we took the traditional deviled egg and made it bite-sized using quail eggs. 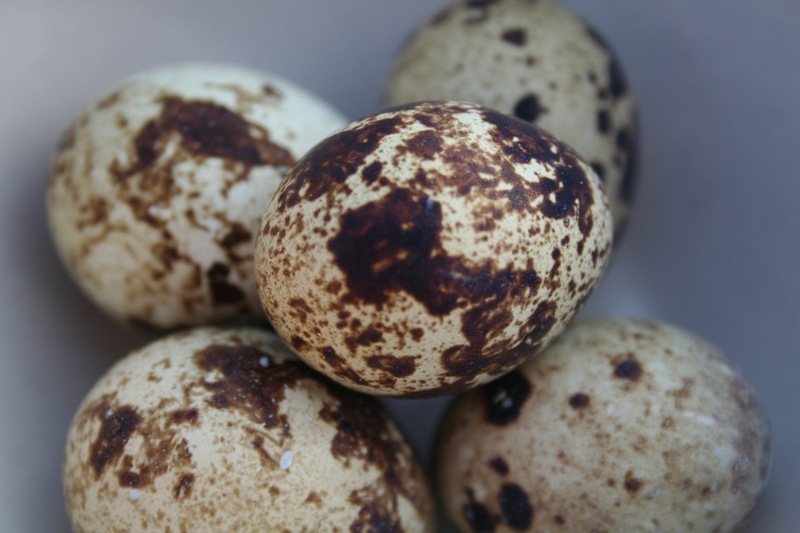 Quail eggs are perfect, and are easily available at many Asian or specialty markets. And not to worry, they taste just like chicken eggs. But what makes a deviled egg is the creamy mayonnaisy topping, and our combination of herbs and spices mixed in, topped with red caviar (a double whammy of eggs! ), makes for a tasty, well-balanced hors d’oeuvre that will disappear off the plate before you know it. 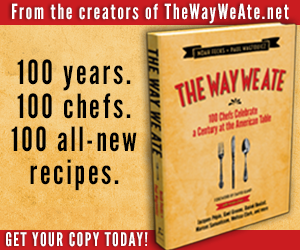 Just make sure you’ve made enough for your guests, and keep those cocktails flowing. We recommend buying extra quail eggs since they are delicate, and you may end up with a few broken before you get home from the market. 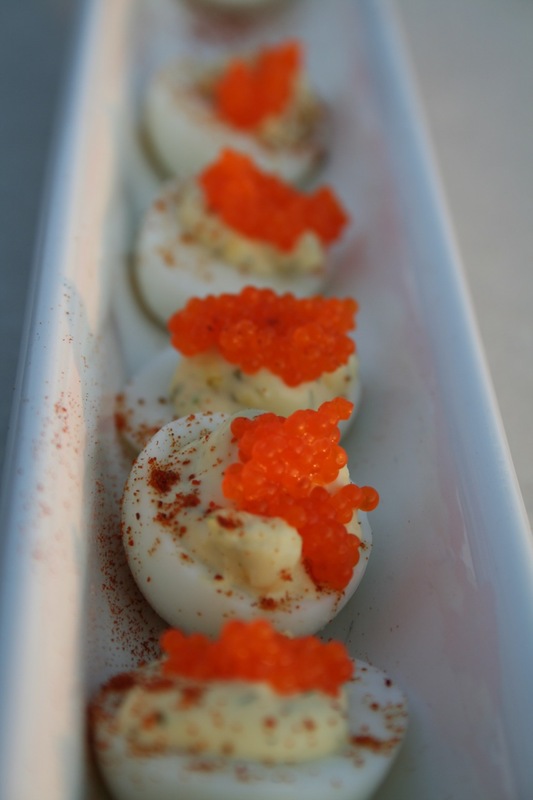 If you are not a fan of caviar, try a few nonpareil capers to top your deviled quail eggs. These tiny briny bites will add a nice piquancy to your eggs, almost the same way that roe would. Wash quail eggs in warm water. Drain and place eggs in small pot. Add water so that it covers eggs. Boil. When water begins to boil, remove from heat and cover for 7 minutes. In the meantime, prepare an ice-water bath. After 7 minutes, transfer eggs to bath. Let cool. Drain. Peel eggs carefully. Slice eggs in half lengthwise with one downward slice (do not slice back and forth as this will tear eggs). Now, drop the hardened yolks in a small bowl. Add sour cream, mayonnaise, and mustard, and mash with a fork until smooth. Add minced scallions, salt, and dill. Mix thoroughly. Fill a small plastic sandwich baggie with the yolk mixture and squeeze into one corner of the bag. Twisting the baggie at the opened end will help you. With scissors, cut a small hole in corner of baggie. Make sure you have a good grip on the baggie that will allow you to pipe the yolk mixture through the hole. Gently squeeze from the top of the mixture, and the filling will begin to pipe out. Fill each egg half. Sprinkle with hot paprika to taste. Dollop with a small spoonful of red caviar. Serve. The deviled quail eggs may be made a day in advance, but add caviar just before serving. Makes 20 eggs, or serves 7. Locating the air pocket under the shell at the base of the egg will make peeling the egg so much easier. Just tamp the base of the egg on a hard surface and start peeling under gently running water. Serve your deviled quail eggs halfway through your cocktail party. Pass the tray from guest to guest. Tell them that you just retrieved them from the fridge. That way, they’ll know it hasn’t been sitting out for a spell. We created a special Champagne cocktail for our friend, the actress Julie White, to be paired with deviled quail eggs. 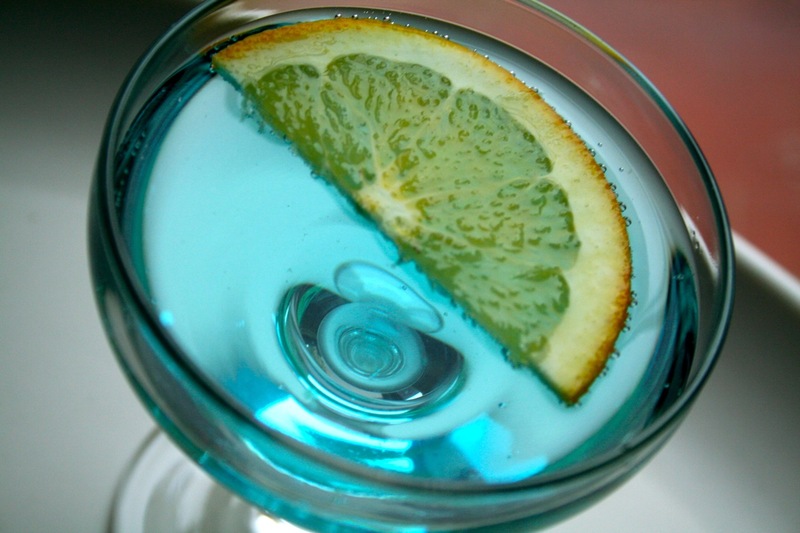 This brazen sky-blue drink, dubbed the Bird Nest, looks adorable in a small Champagne coupe. Other cocktails, such as the Martini, Violet Sparkler, La Violeta, Srirachacha, and the French 75, would feel equally at home alongside these mini bites. The Bird Nest, made blue by blue curaçao, is a charming Champagne Cocktail spiked with a little tequila. And if you’re up for some cocktails that benefit texturally from egg whites, the Ramos Gin Fizz just might be the hombre you were looking for. Perfect for a brunch affair. Or perhaps some PAMA Nog, which we introduced to you in our last post, may be served to a group of thirsty guests hankering for something frothy and fruit-tastic. Having dessert? The Maltese, with its coffee, cinnamon, and vanilla flavors, will light up any end to a meal. We know, it’s so hard to choose.